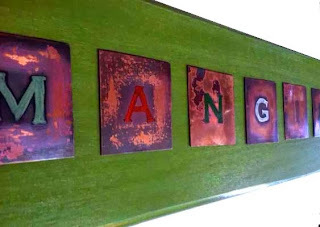 Mangia Kitchen Sign: Now on Etsy! Made from enamel on copper with painted wood mounting board. Would fit beautifully under a kitchen cabinet over a counter top or anywhere else in the kitchen! Copper is distressed for a rustic feel and the letters are carefully enameled in tones of the Italian flag colors: green, red and white. This is a fun piece worthy of any kitchen that belongs to those who love food! Thank you for stopping by Pop Up Shaker!